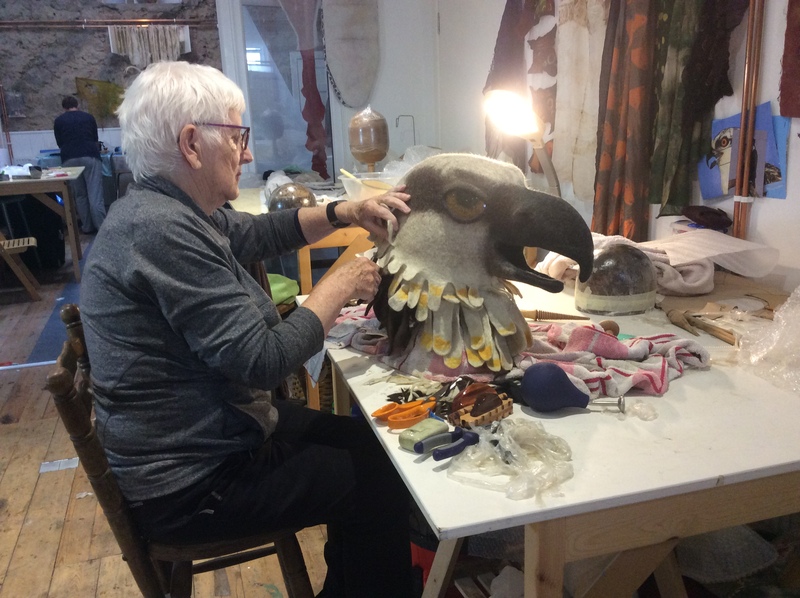 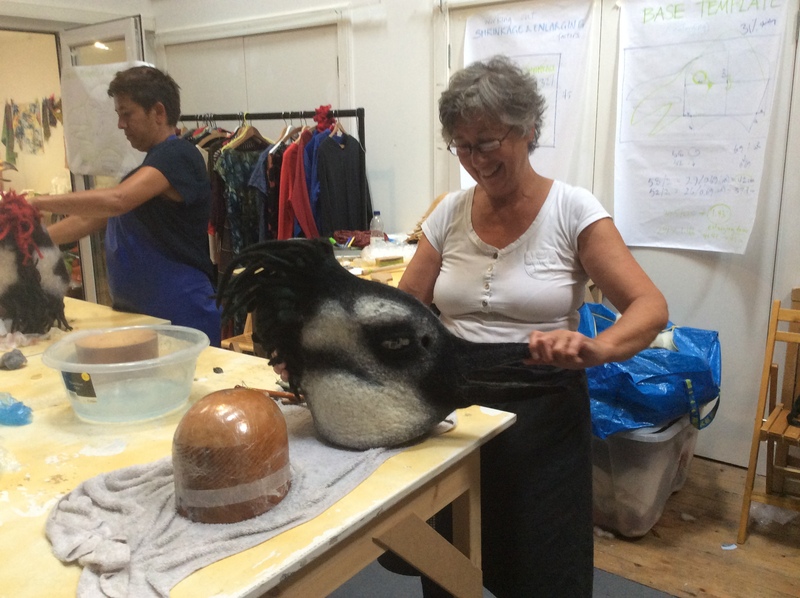 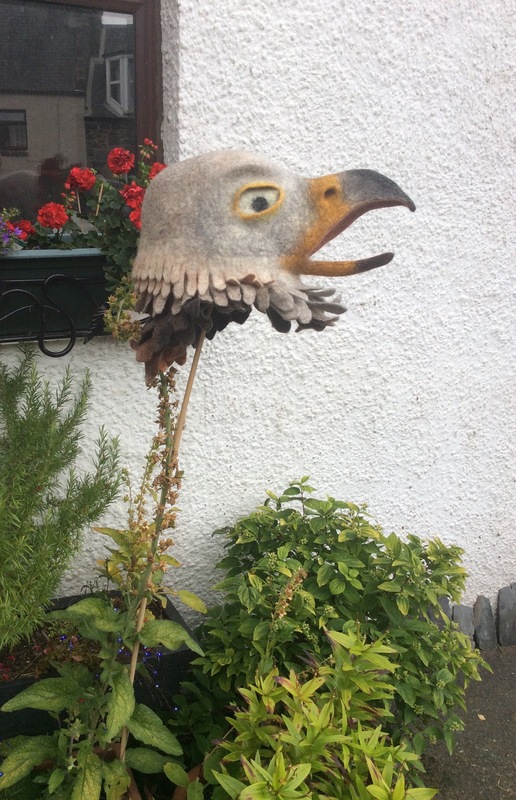 Last week I attended a wonderful four-day Bird Mask Workshop with Internally renowned feltmaker Gladys Paulus at Big Cat Textiles in Newburgh near Perth. 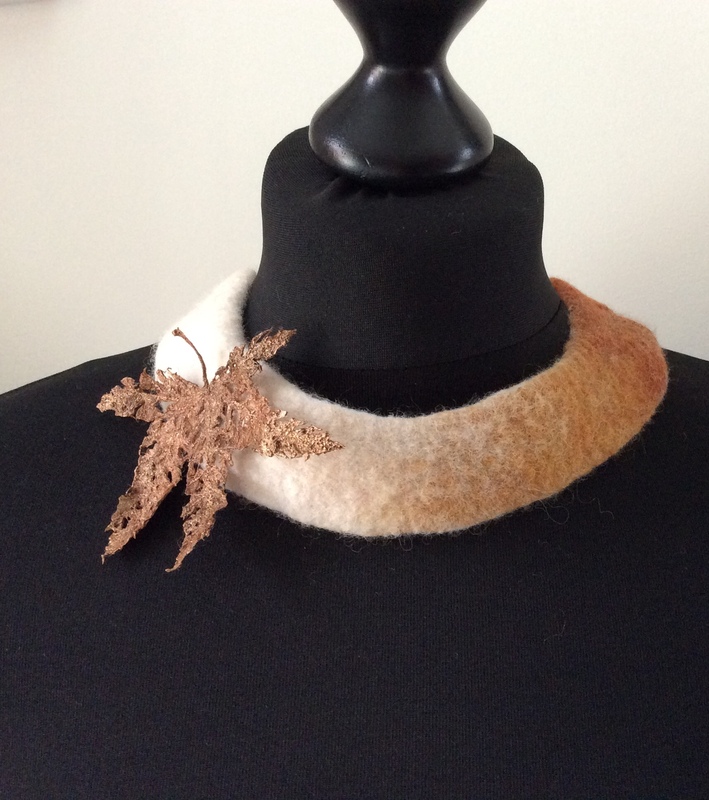 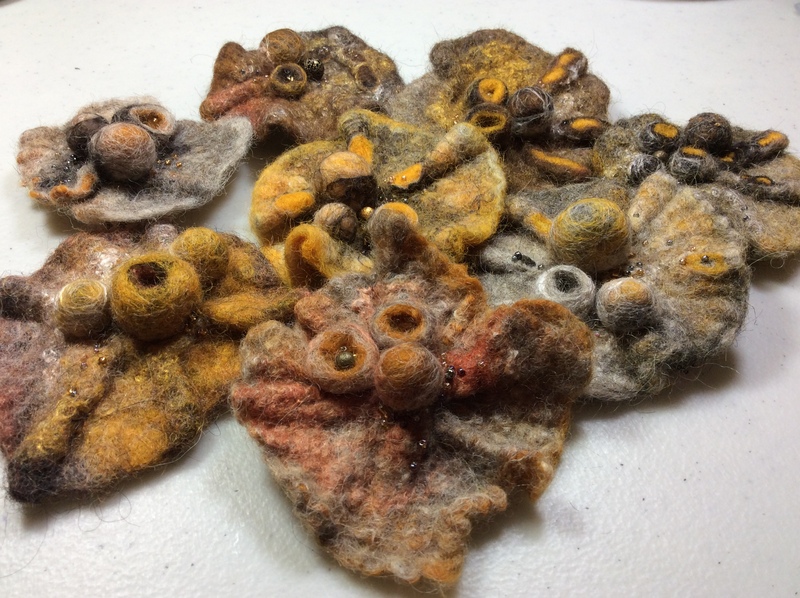 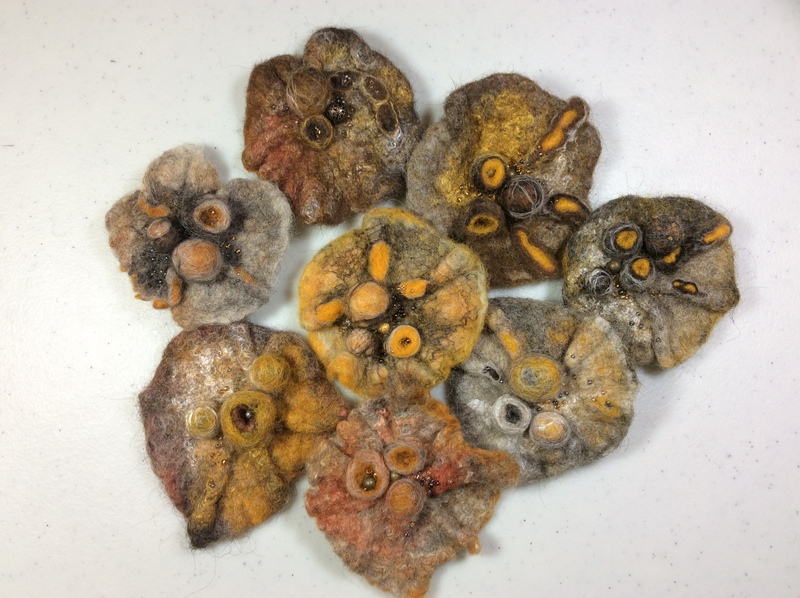 Gladys has been high on my list of tutors I’ve wanted to work ever since I started felting. 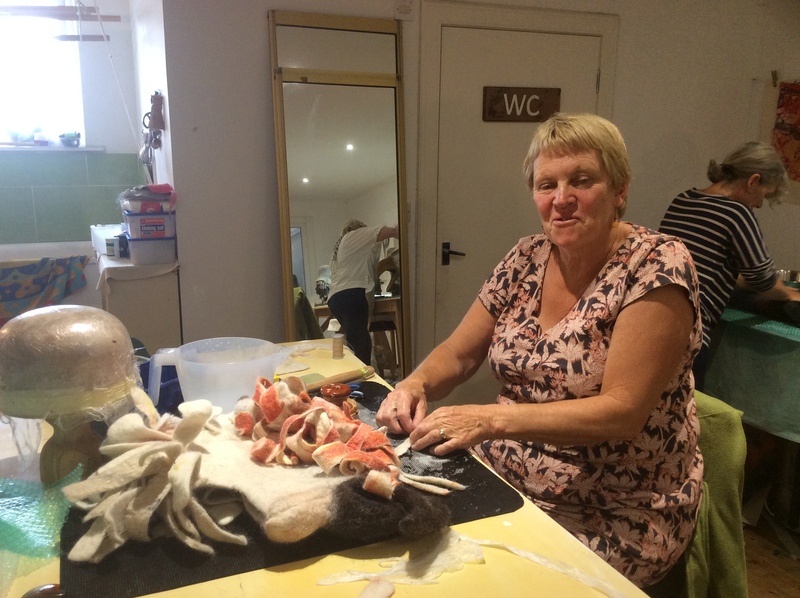 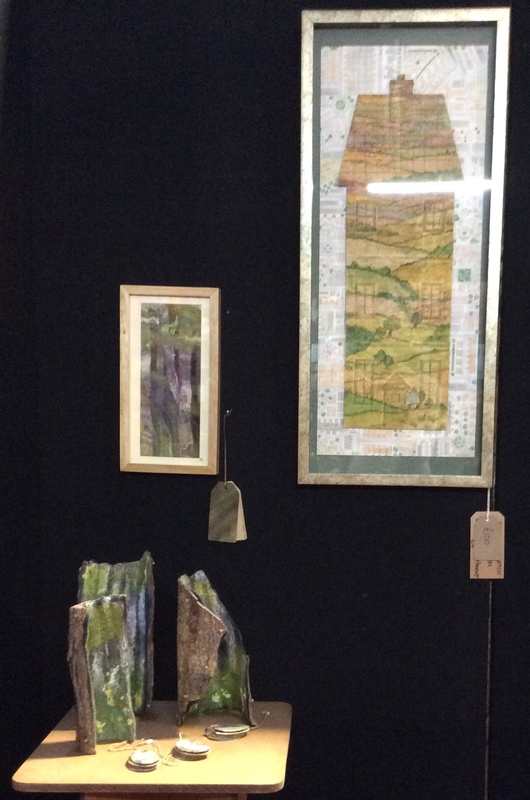 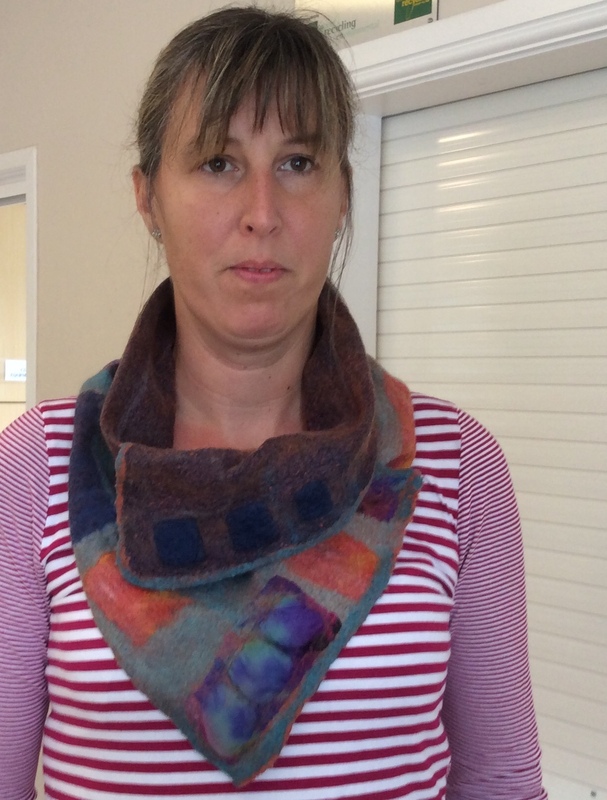 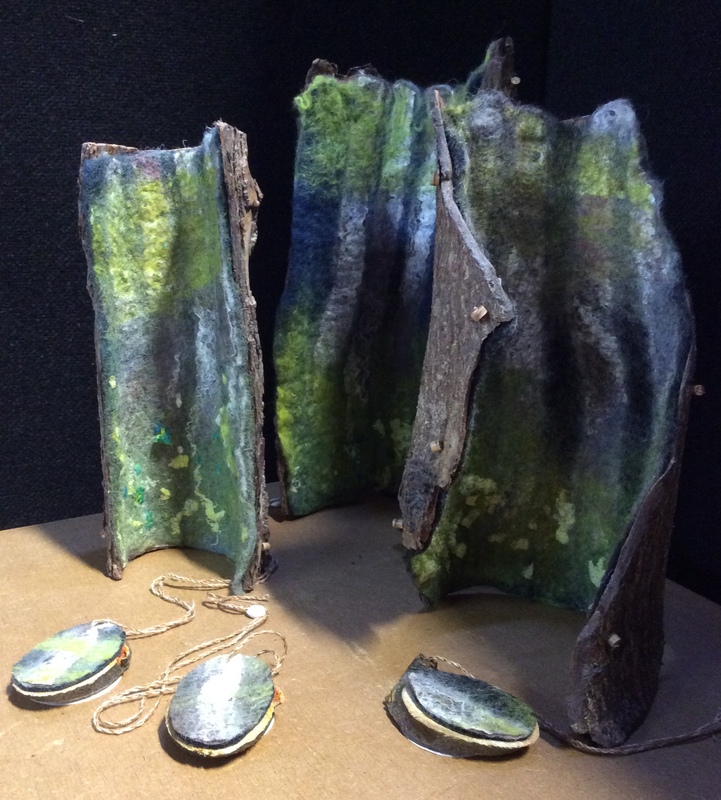 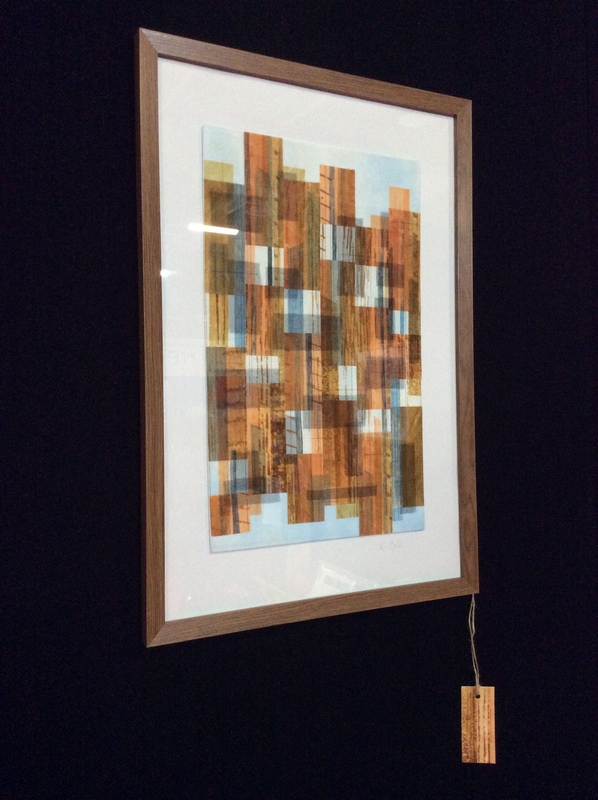 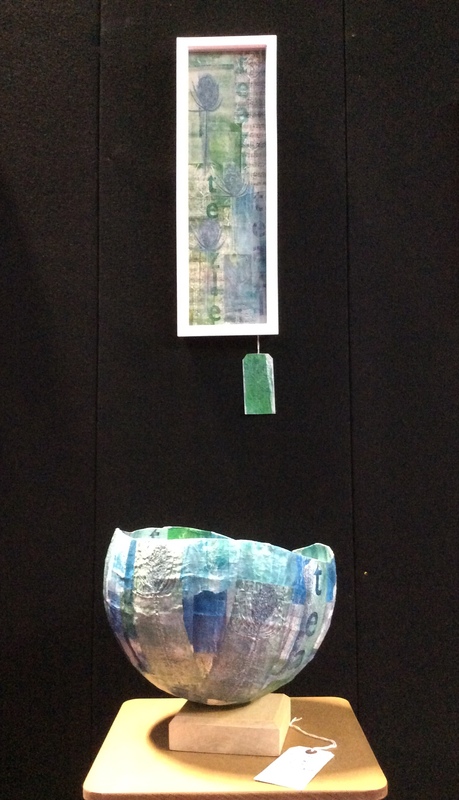 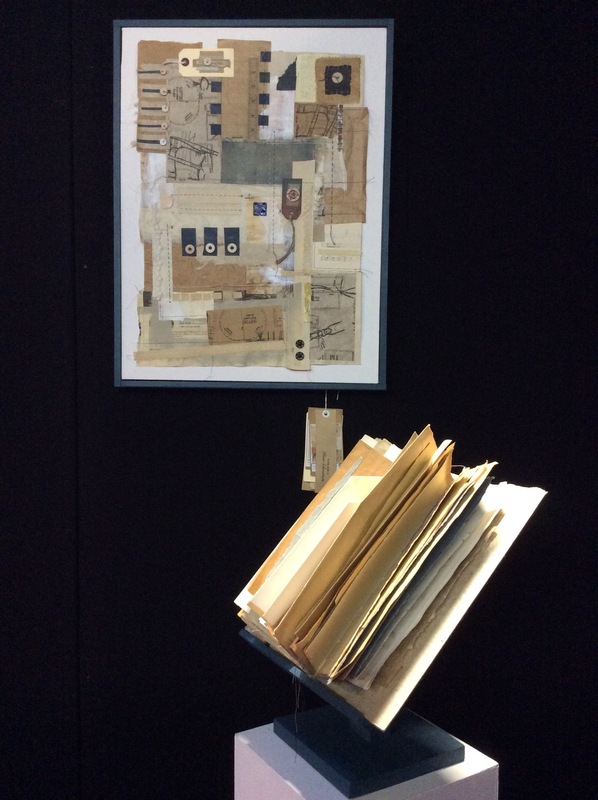 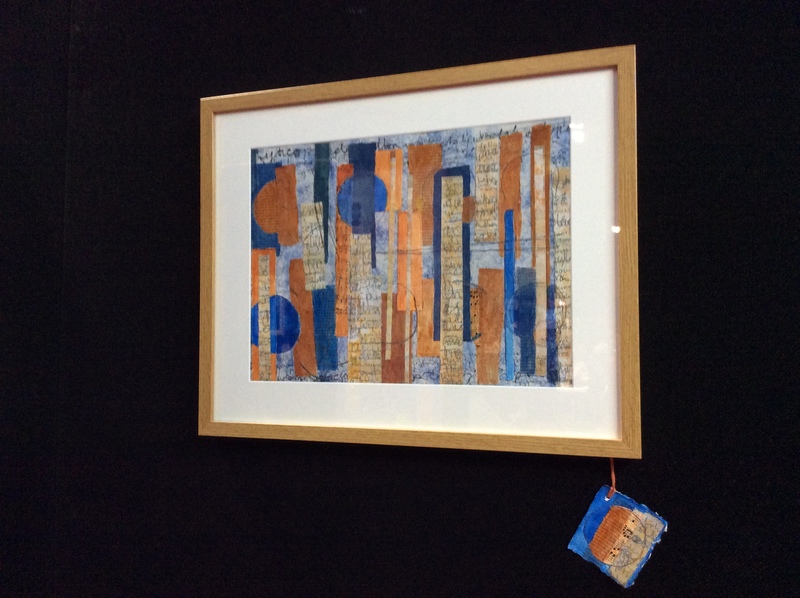 Her three-dimensional work is exceptional and she is such a warm and generous tutor. 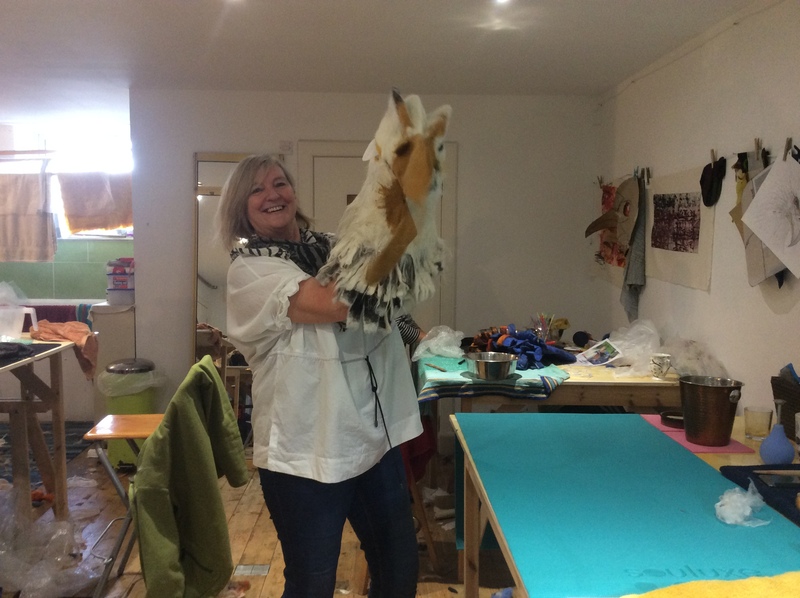 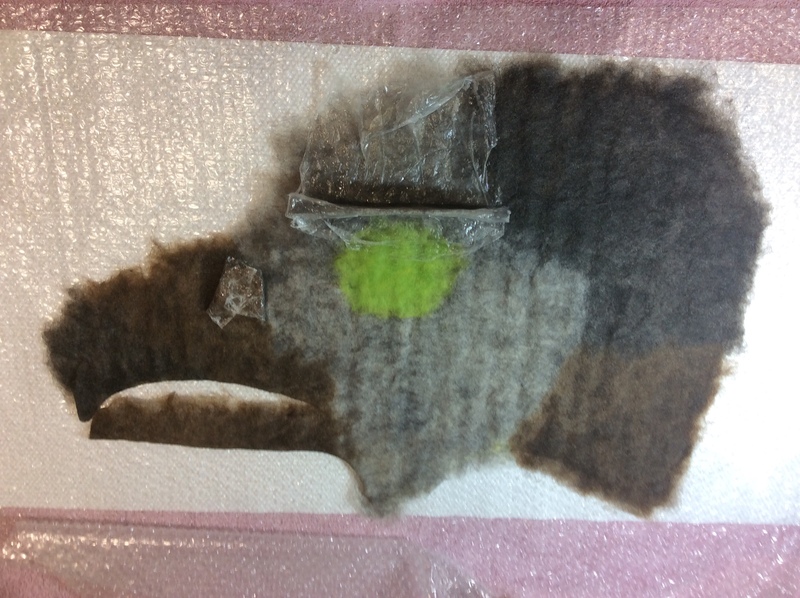 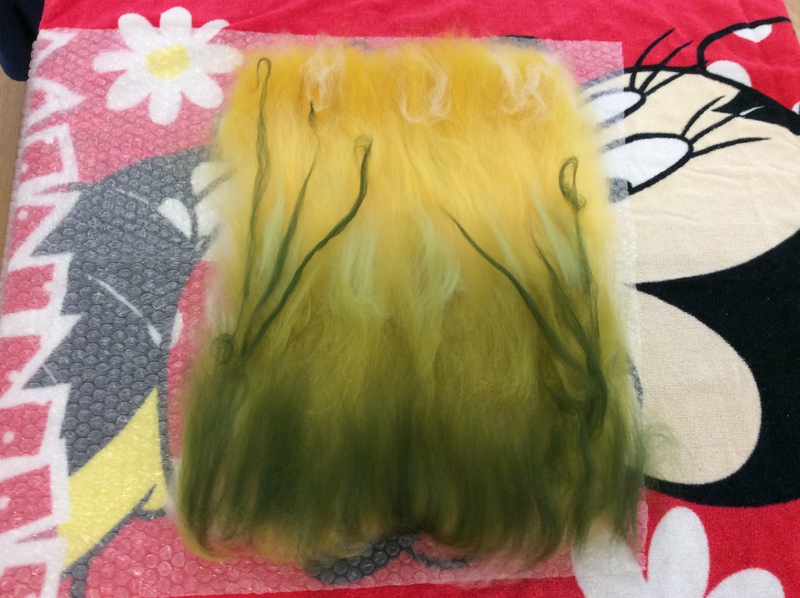 I chose to make my mask using Bergschaf fibres and originally he was going to be a red kite……I soon realised I wasn’t going to achieve that aim in the time we had so he morphed into a generic bird of prey! 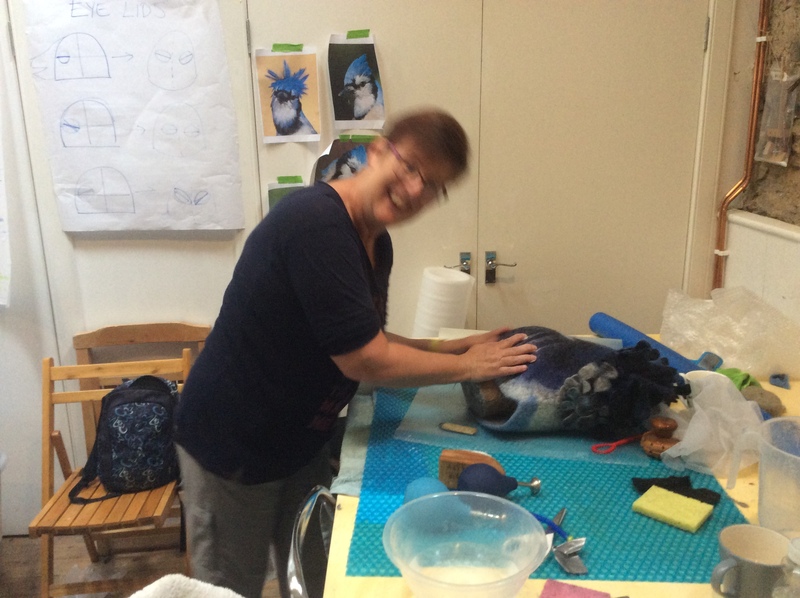 Apologies for the fuzzy images but with a four-day schedule time was always going to be tight so photography wasn’t high on my list of priorities! 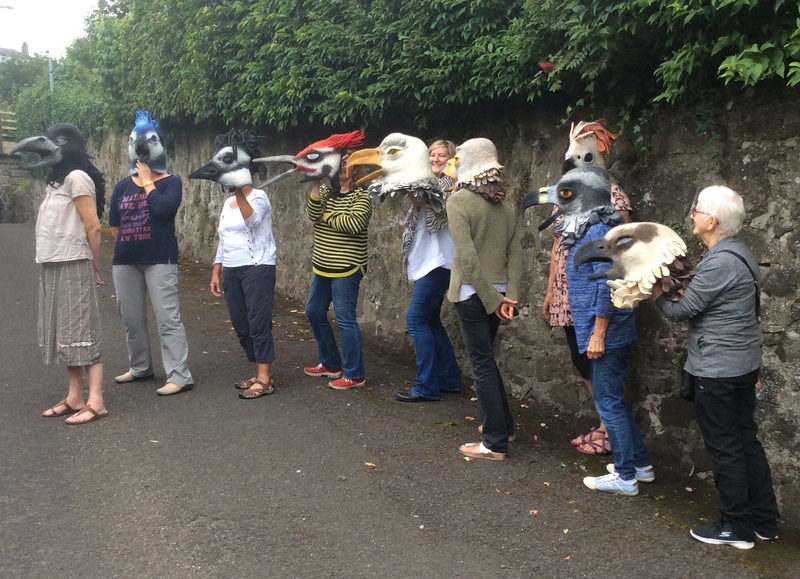 Liz was always one step ahead of the group! 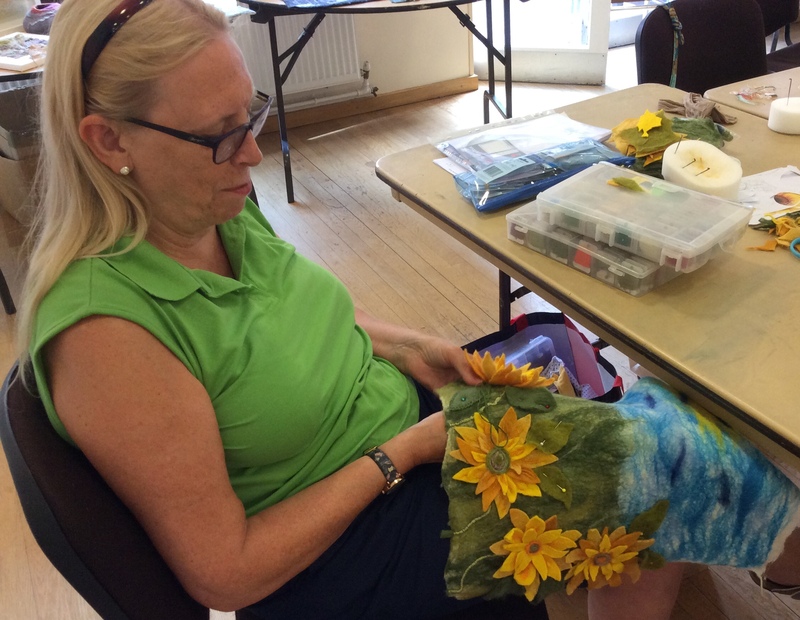 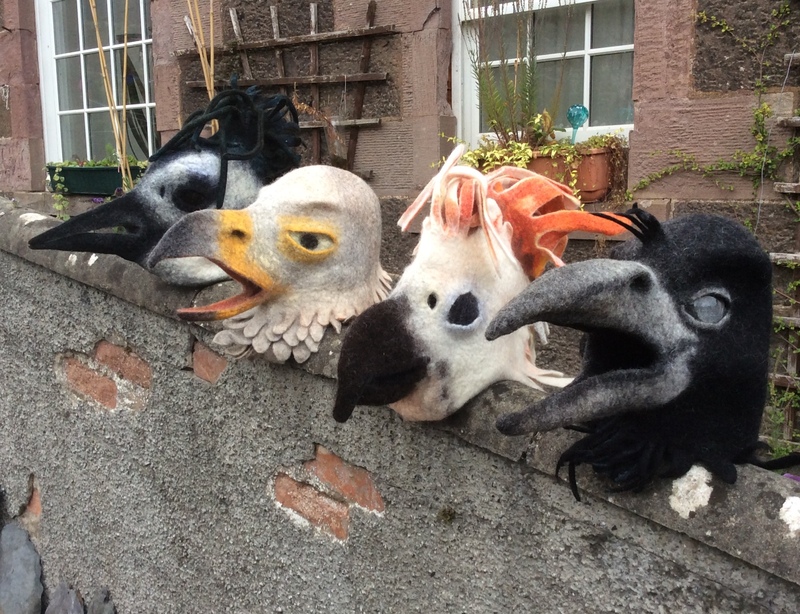 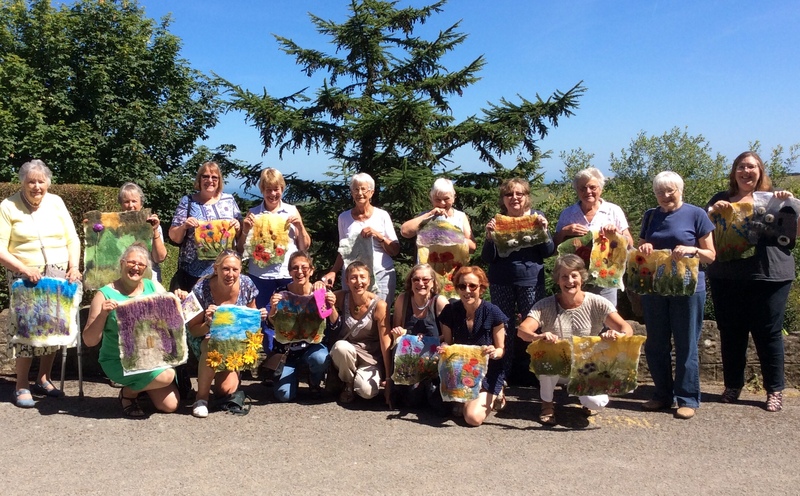 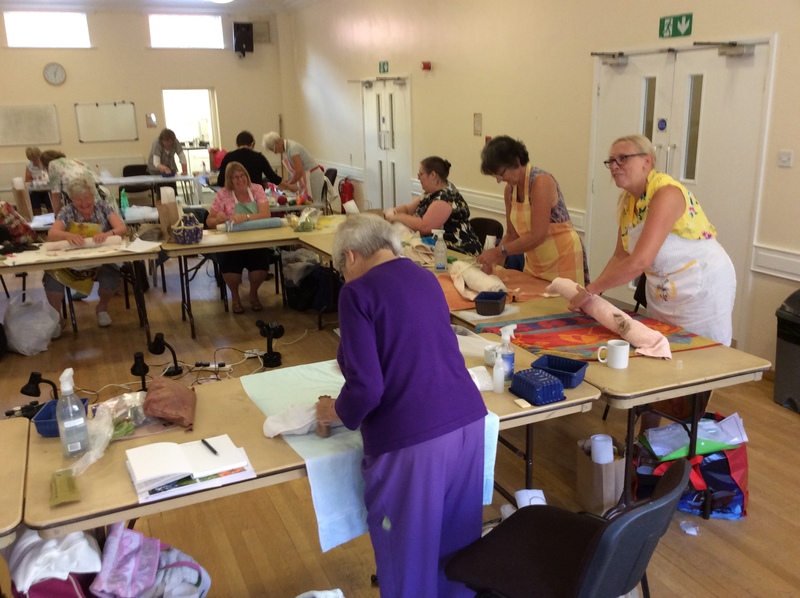 We all learnt such a lot in the four days and everyone came away excited and very pleased with their finished piece of work…..
A gaggle of bird masks! 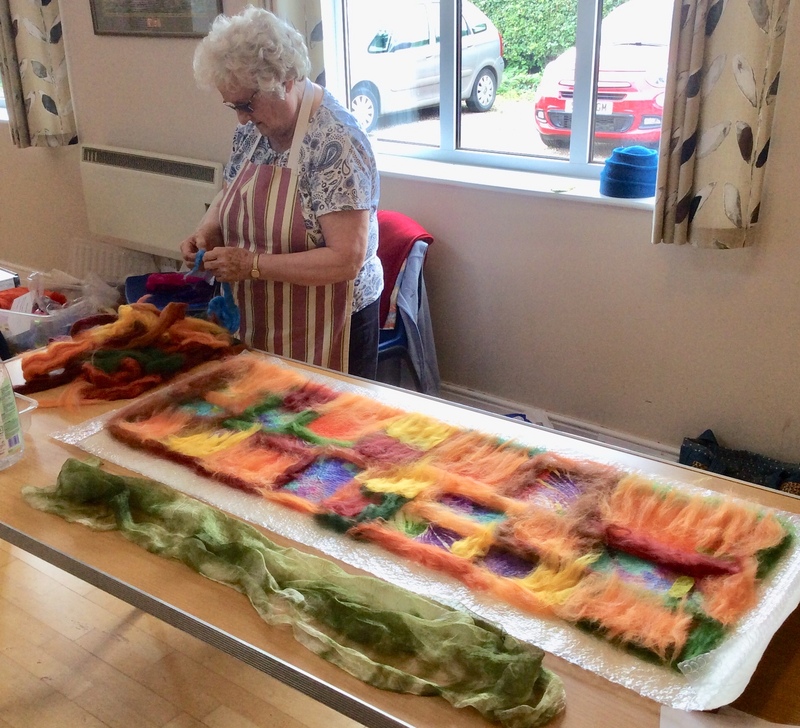 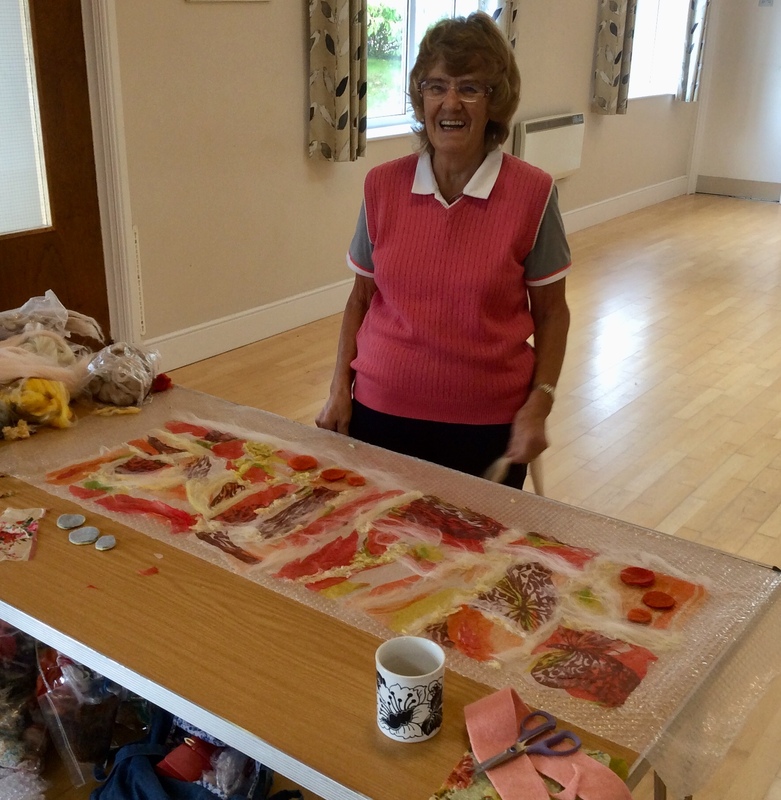 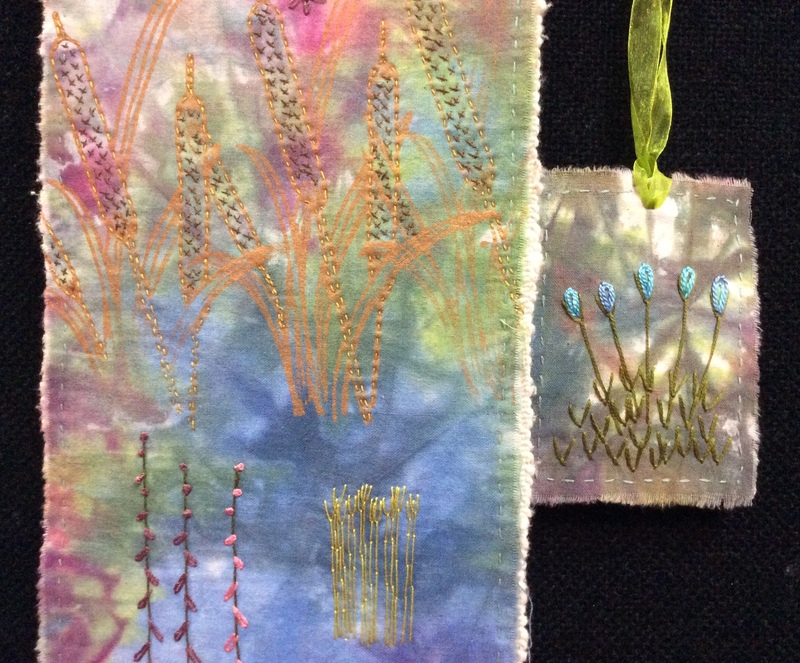 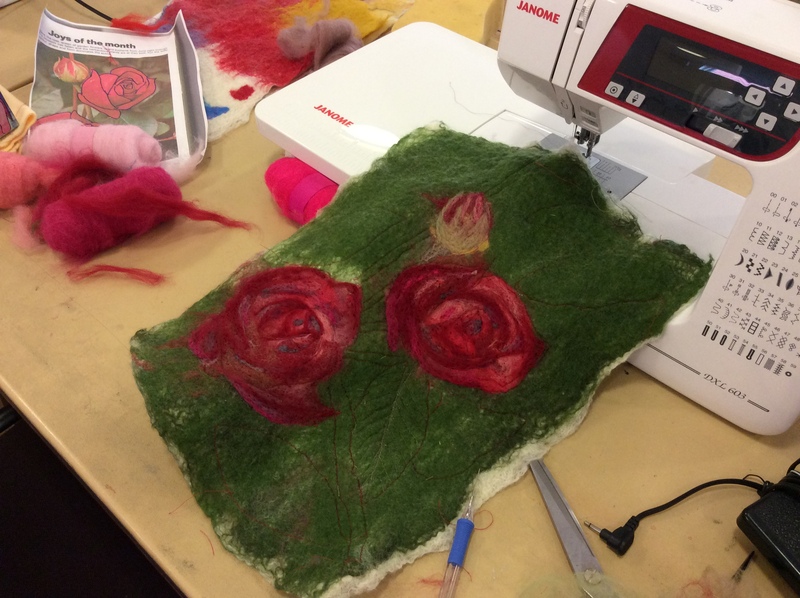 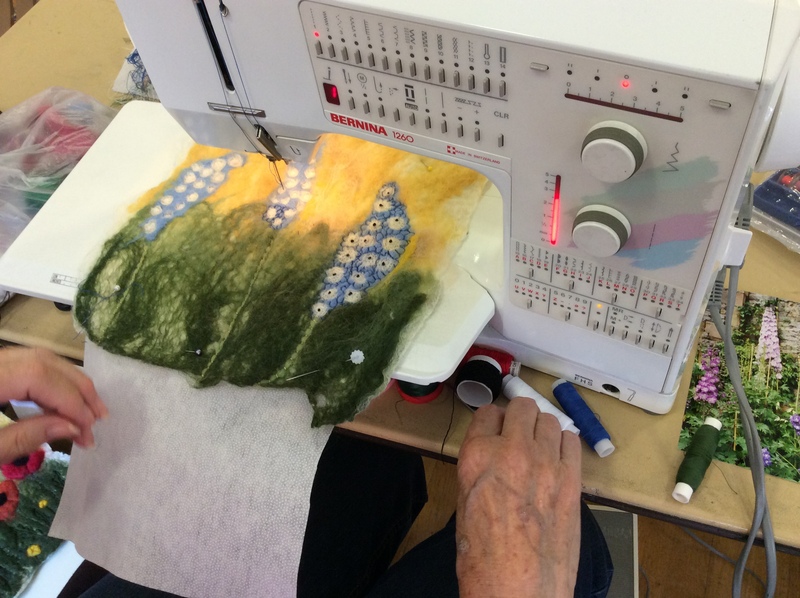 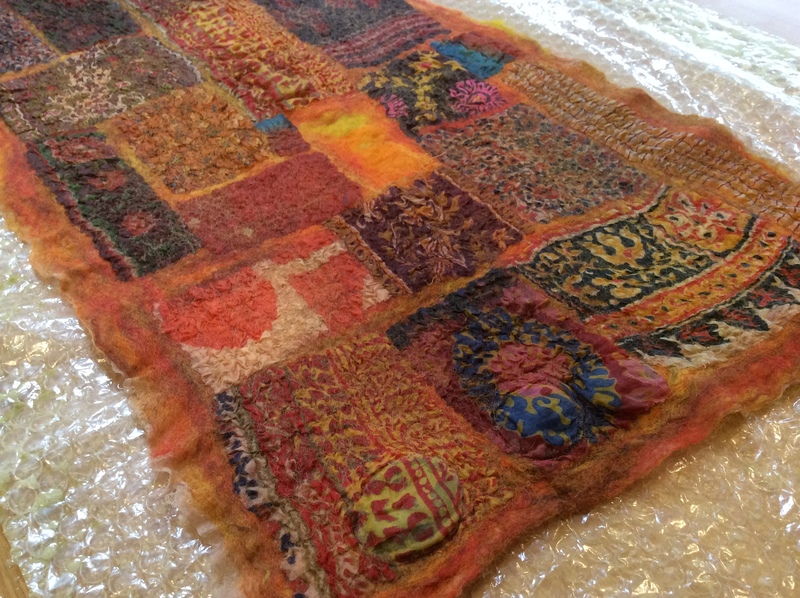 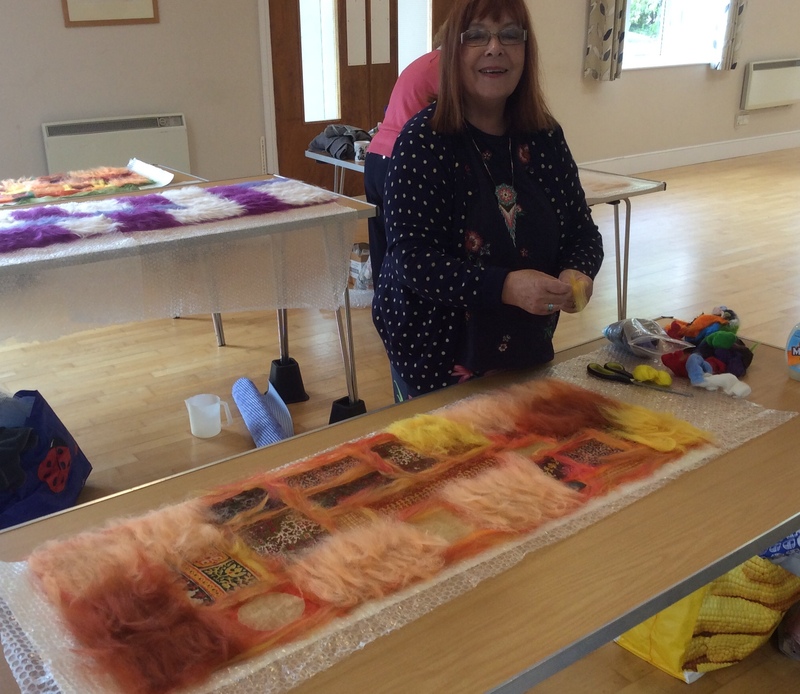 Thanks to Gladys for an inspirational workshop and many thanks to Alison and Netty at Big Cat Textiles for looking after us and being such wonderful hosts! 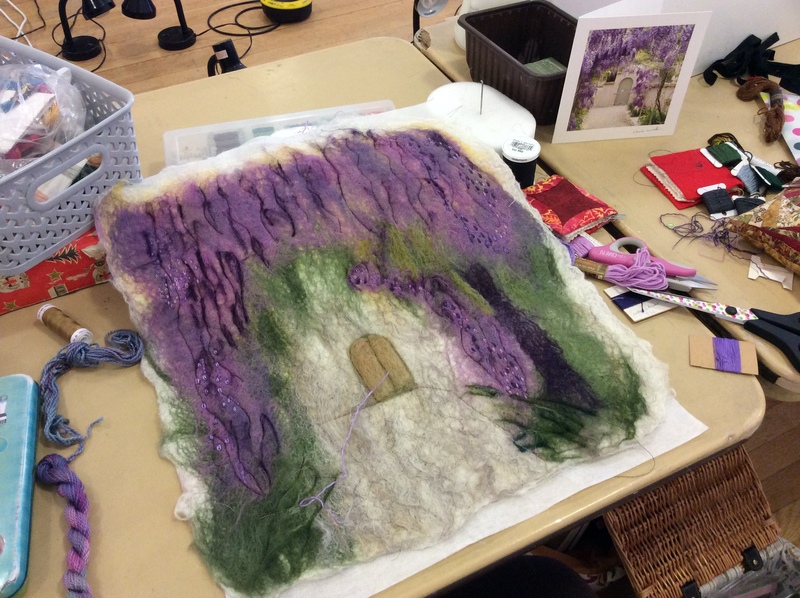 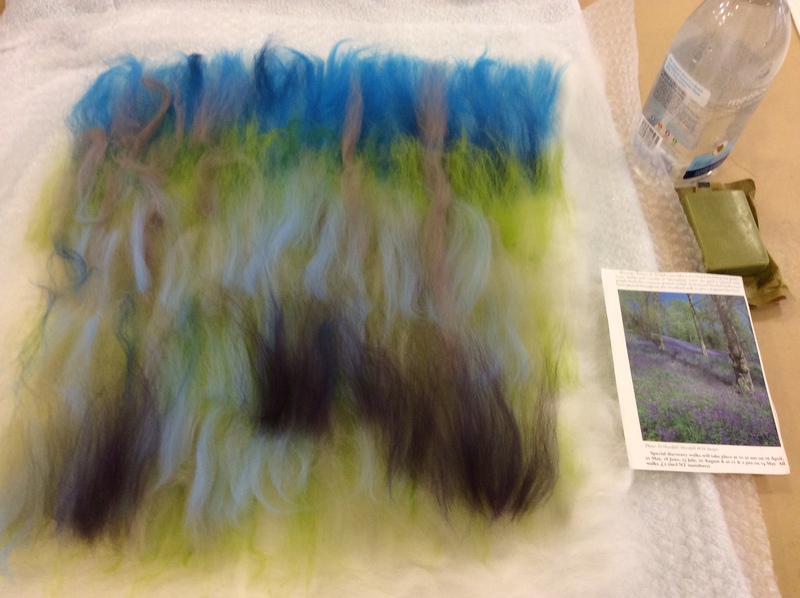 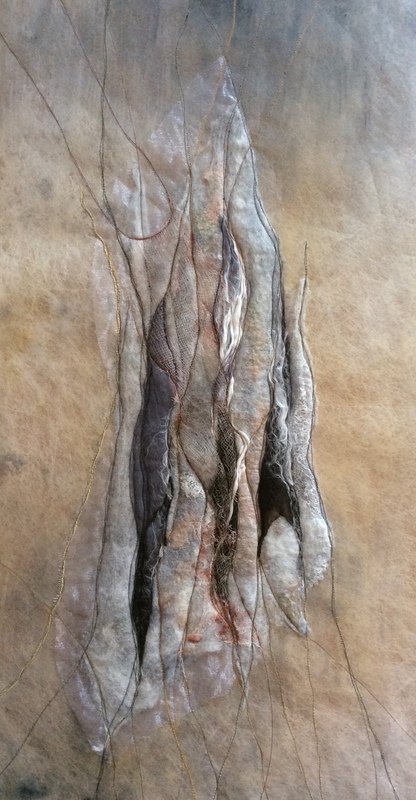 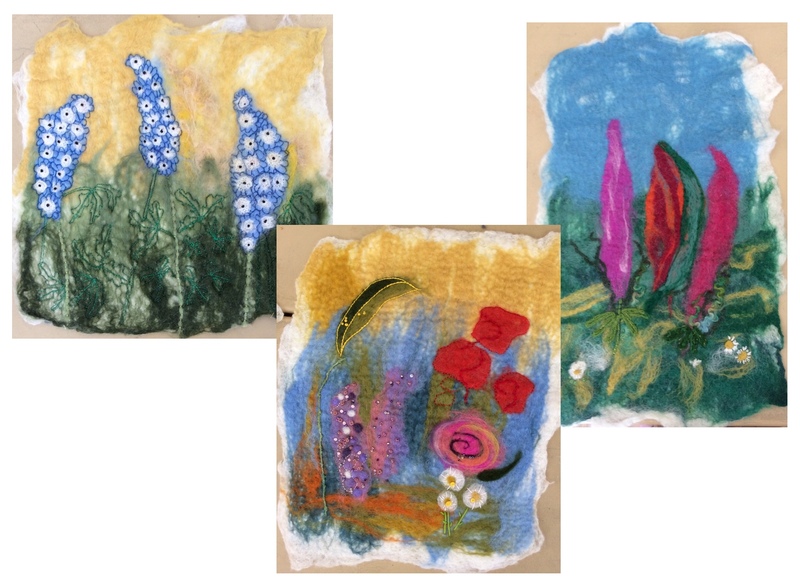 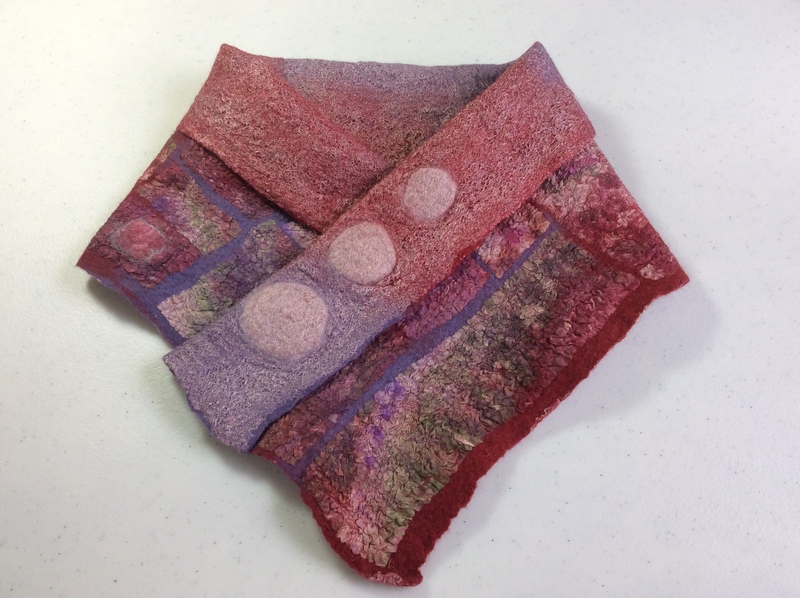 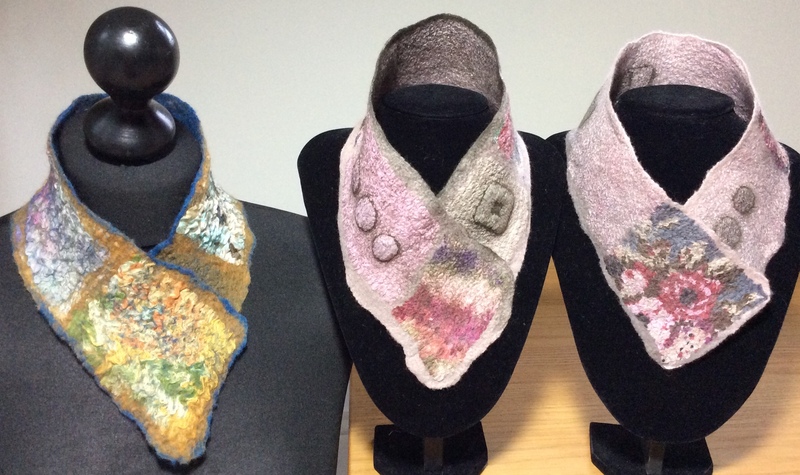 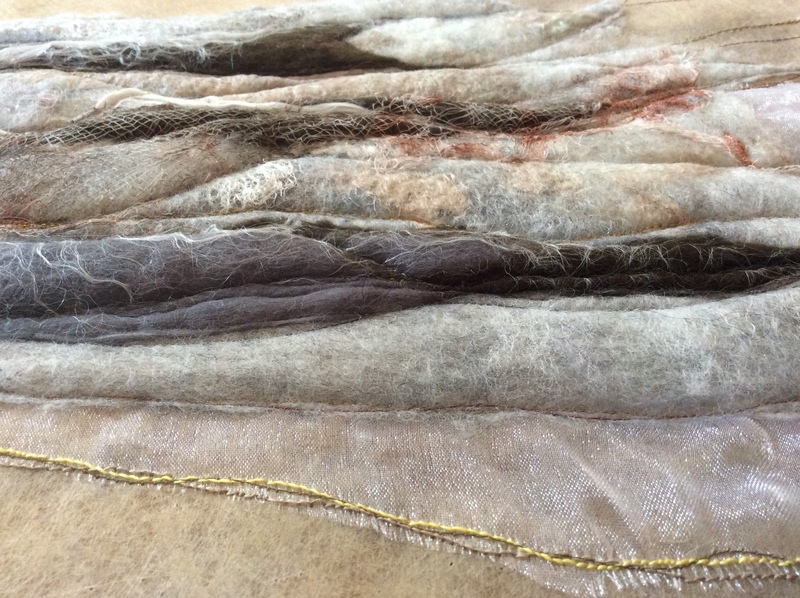 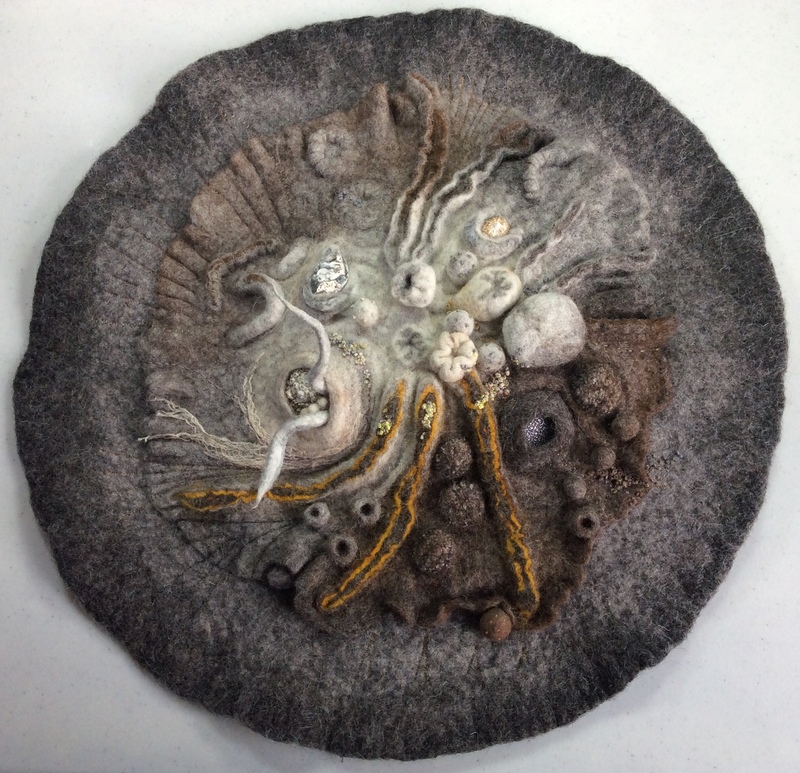 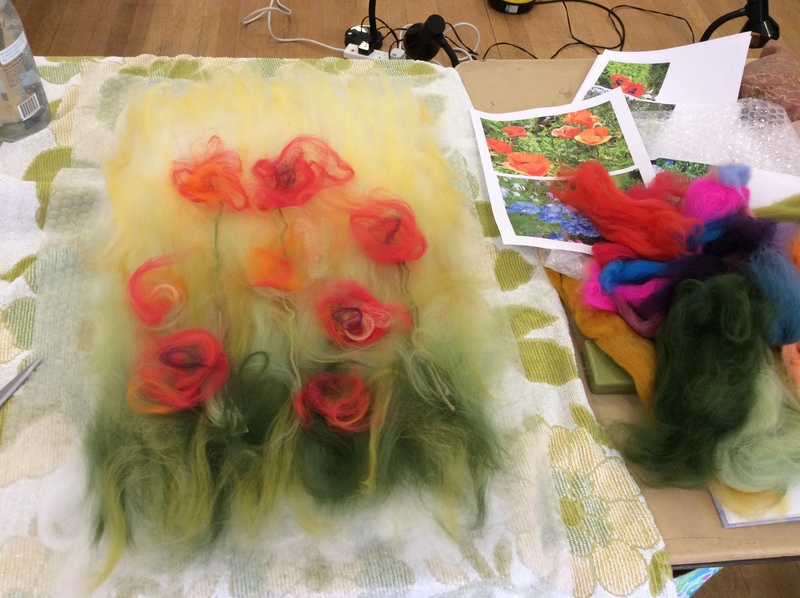 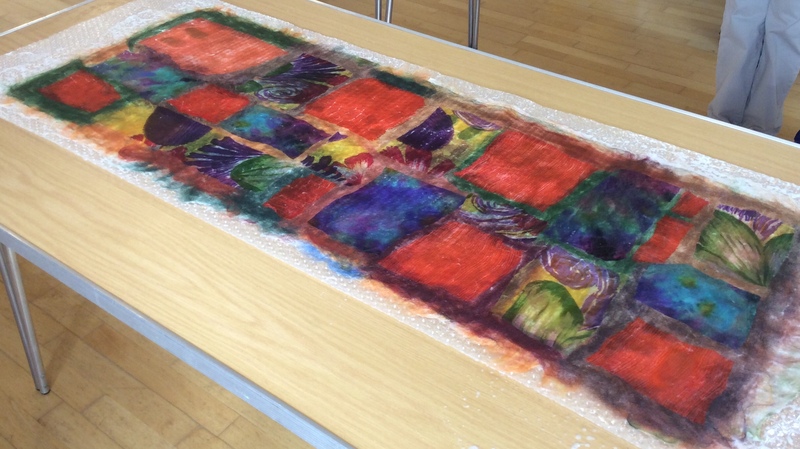 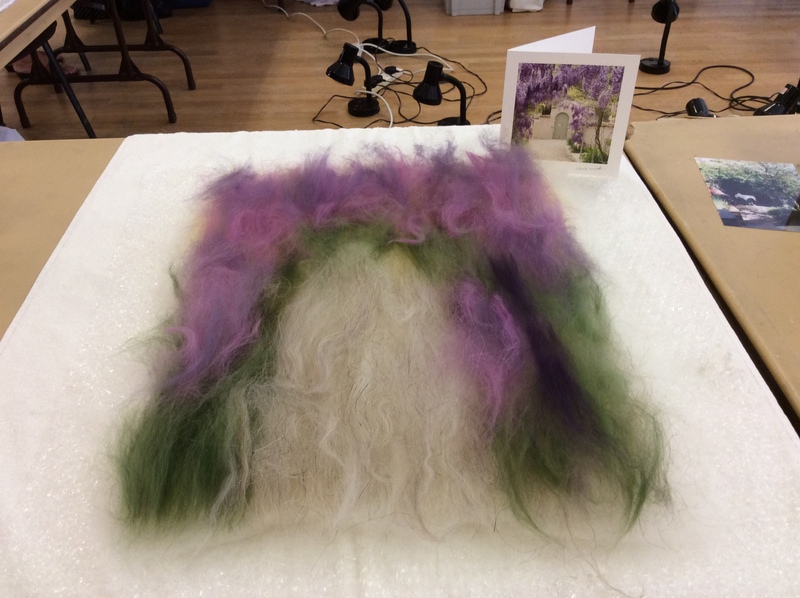 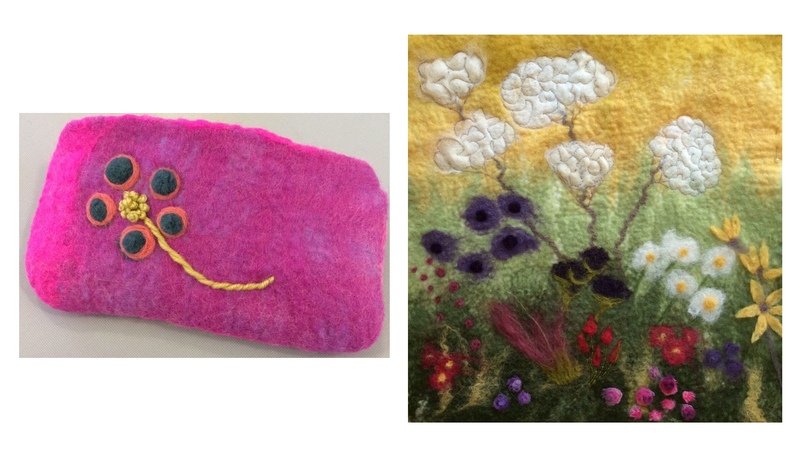 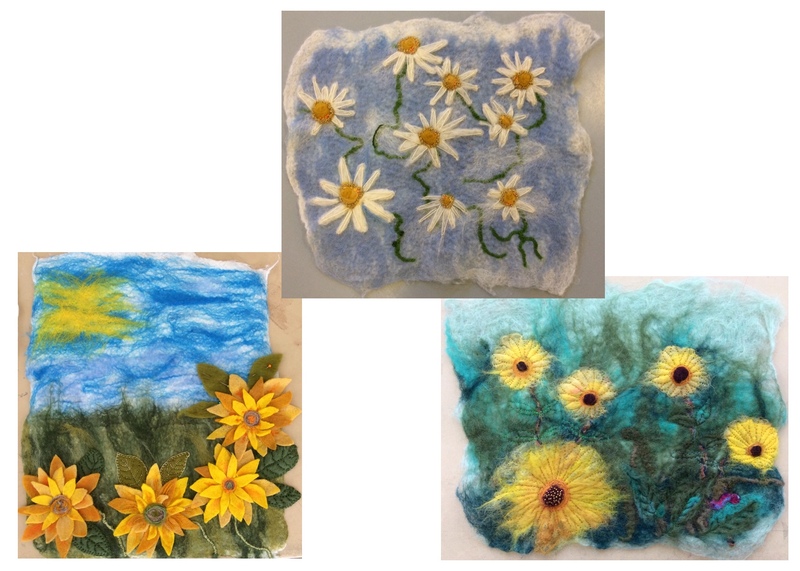 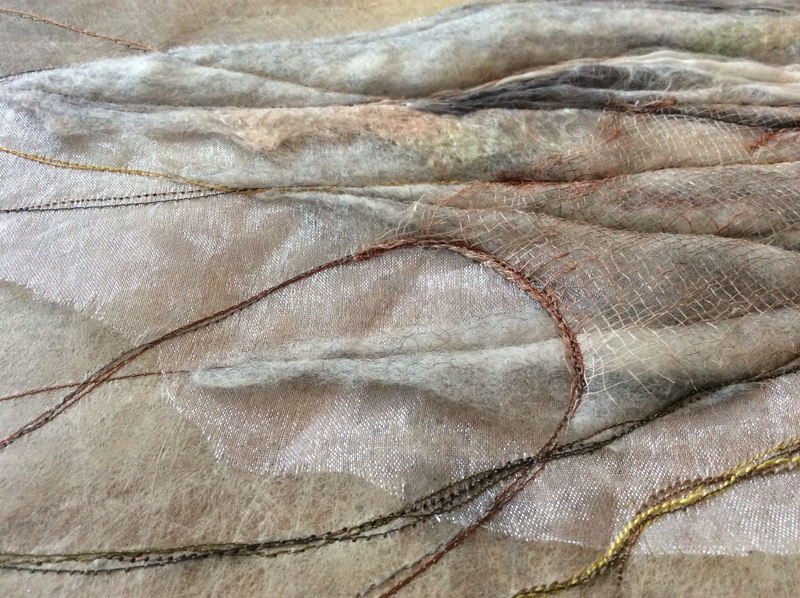 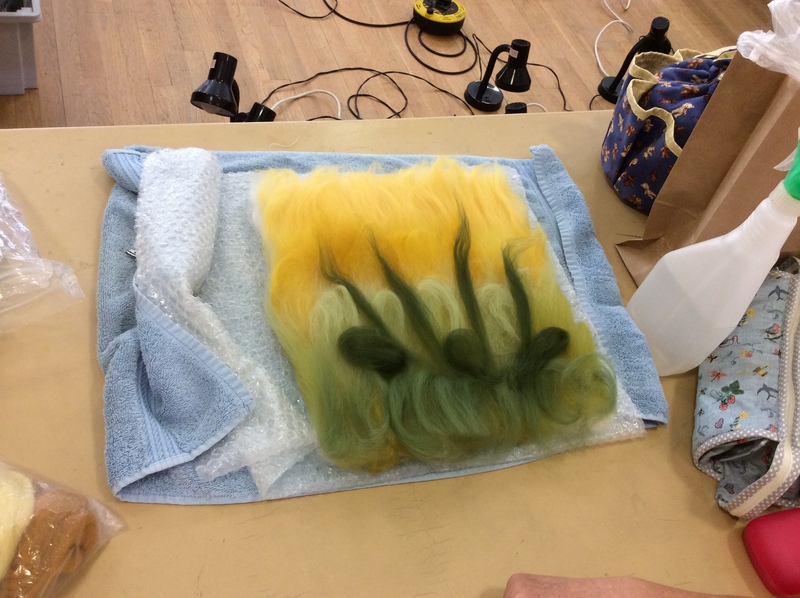 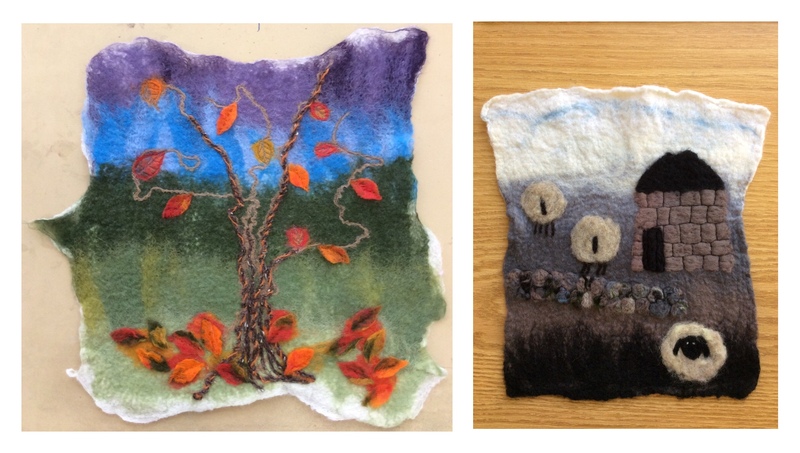 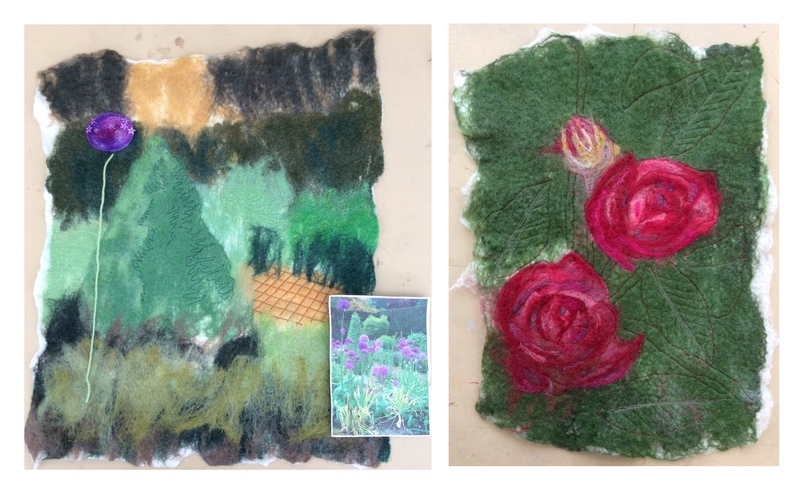 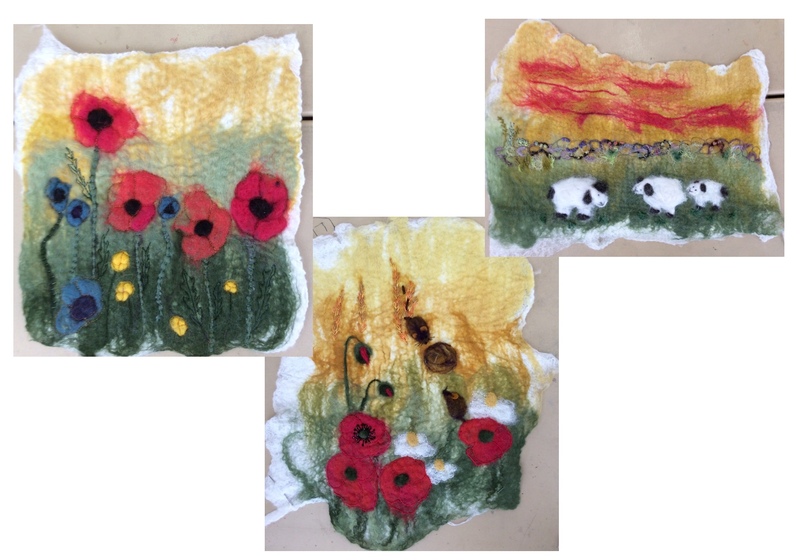 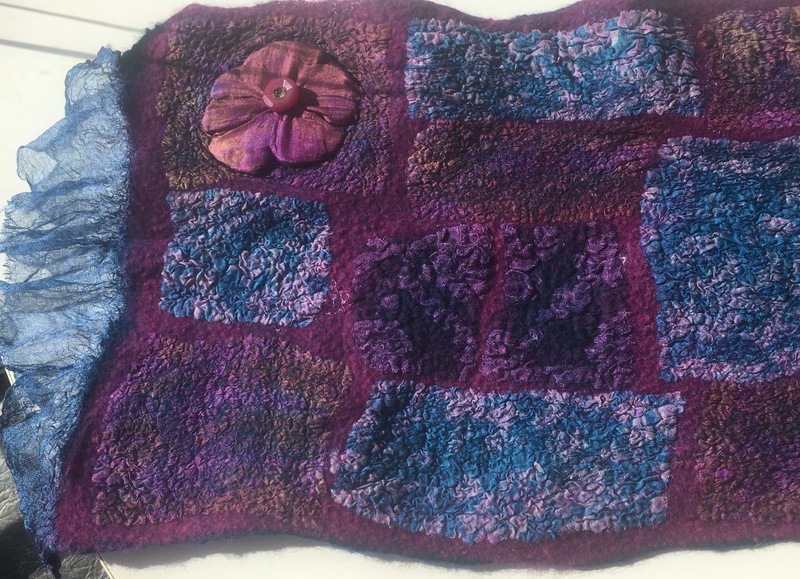 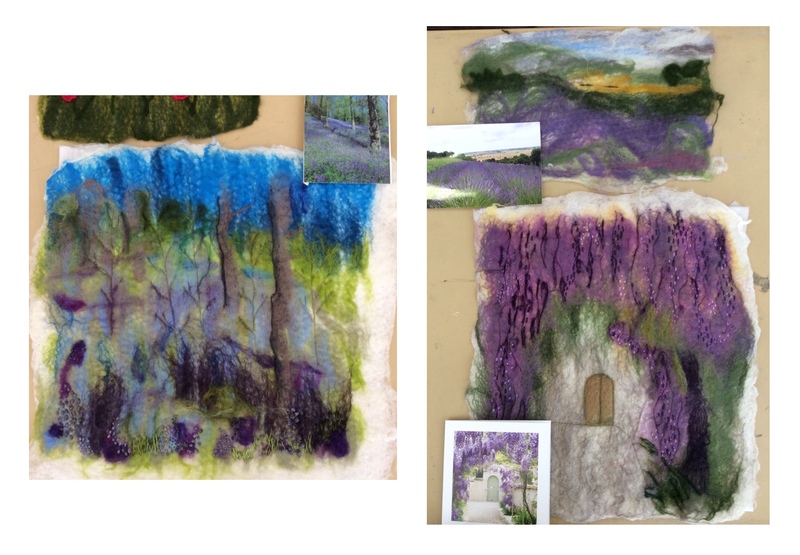 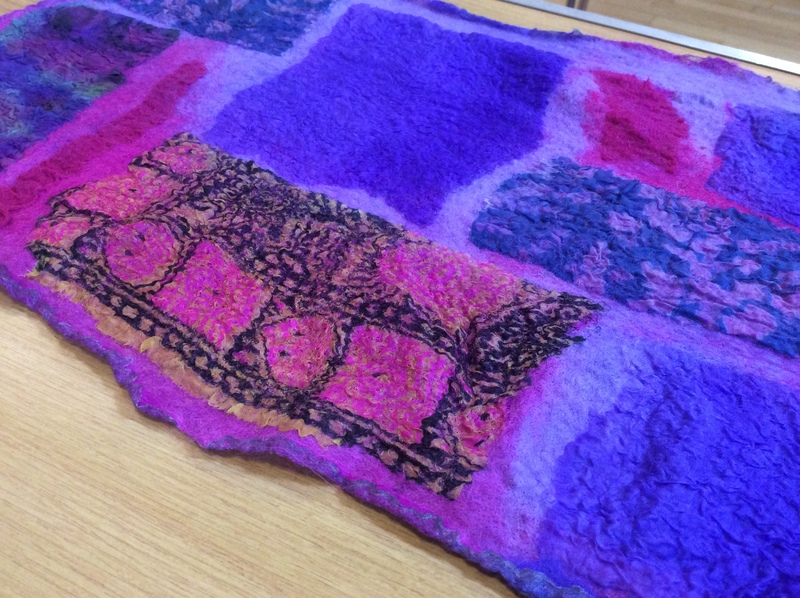 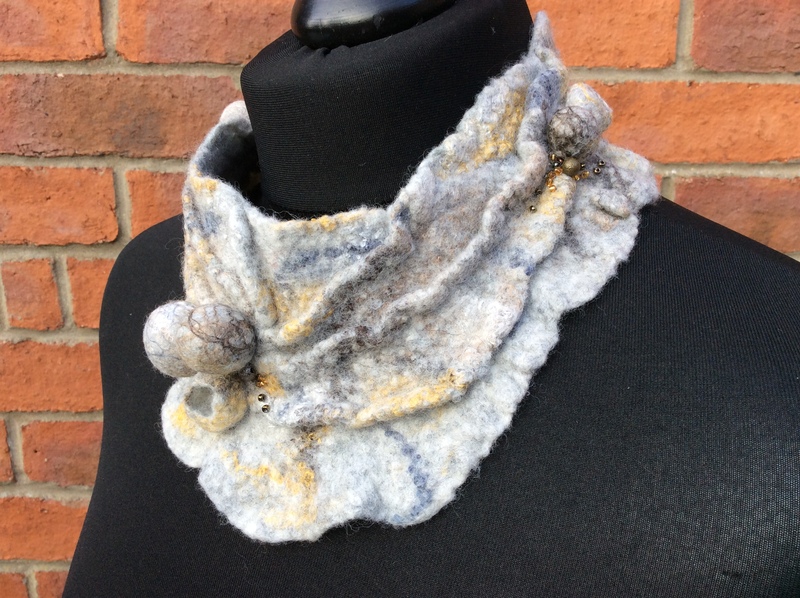 This weekend I am up in North East Yorkshire teaching wet felting at the E.Y.E.s (East Yorkshire Embroiderers) annual Residential Weekend Retreat. 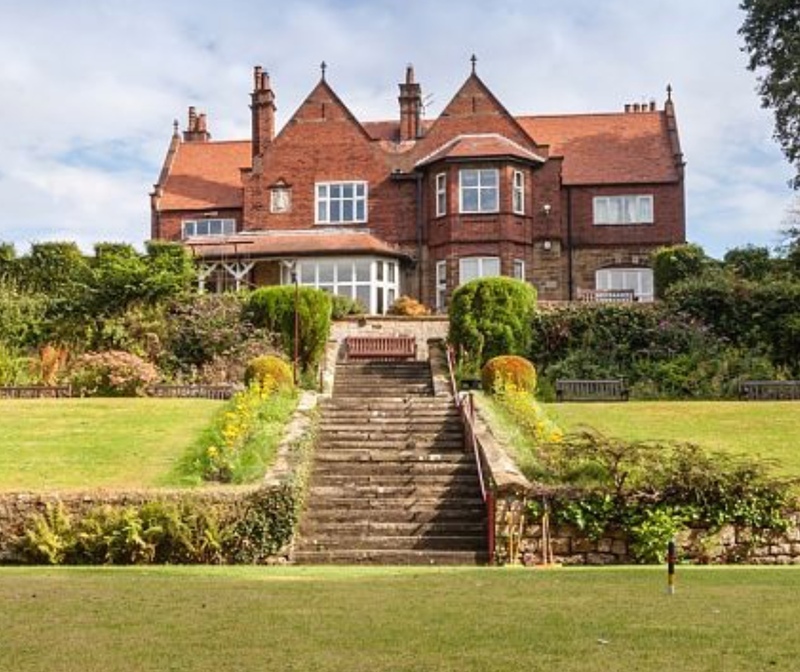 It’s being held at a wonderful venue called Cober Hill, overlooking the North Bay Area of Scarborough. 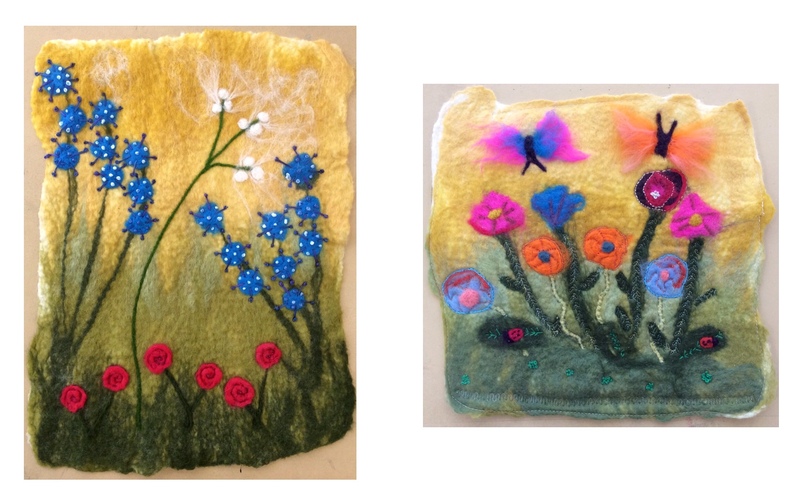 Out of the 18 ladies attending sixteen are creating wet felted pictures while the other two are here doing their own thing. 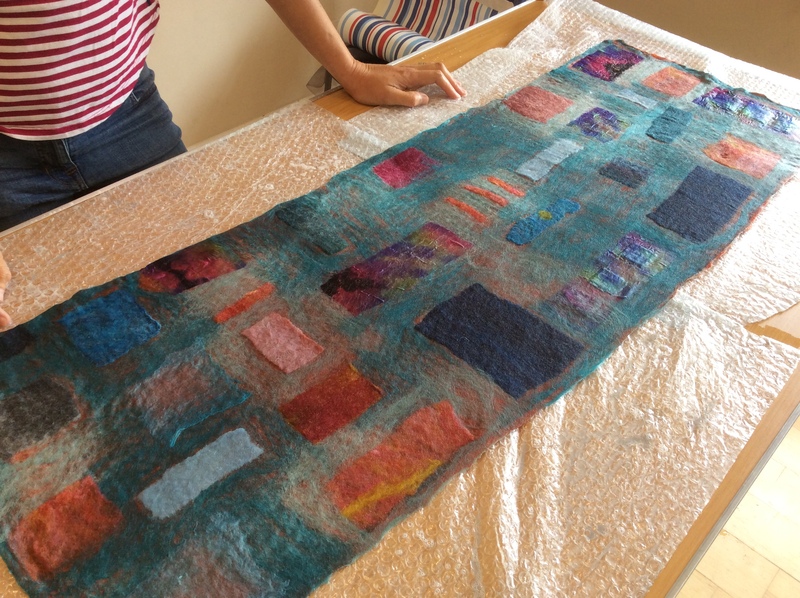 We met up on Friday afternoon and after a brief introduction got straight on with planning our designs and laying out our fibres. 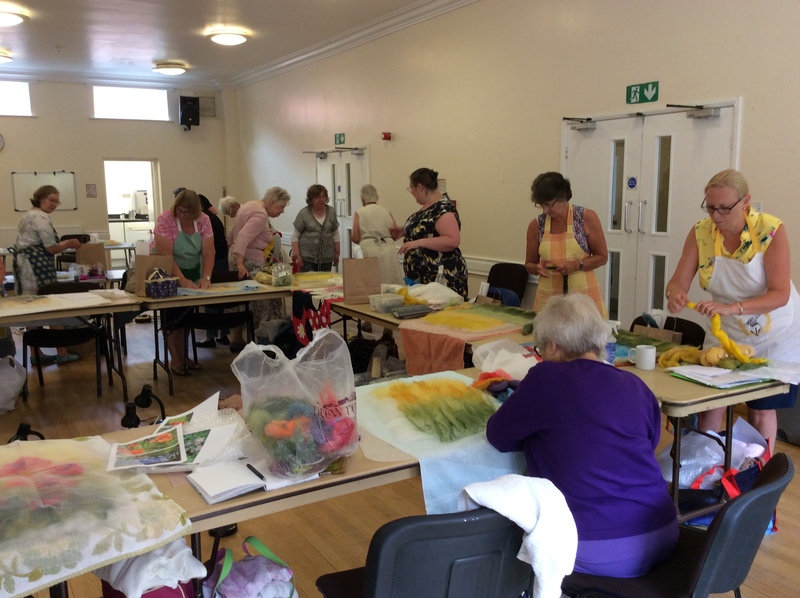 After a three course dinner the ladies were straight back in the studio and hard at work rolling, throwing and generally fulling their work. 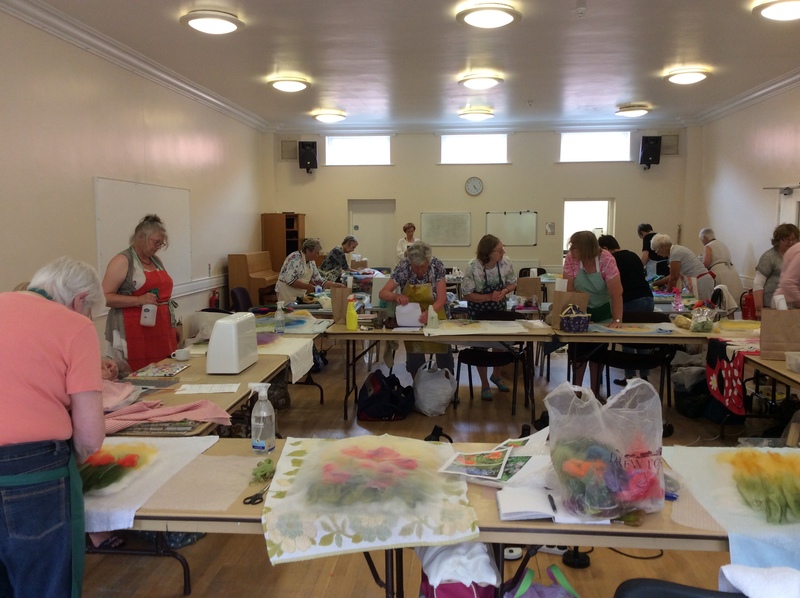 I’d been warned that some of the group would be working all hours and I found myself staying in the studio until 11pm with Ruth who was the last woman standing! 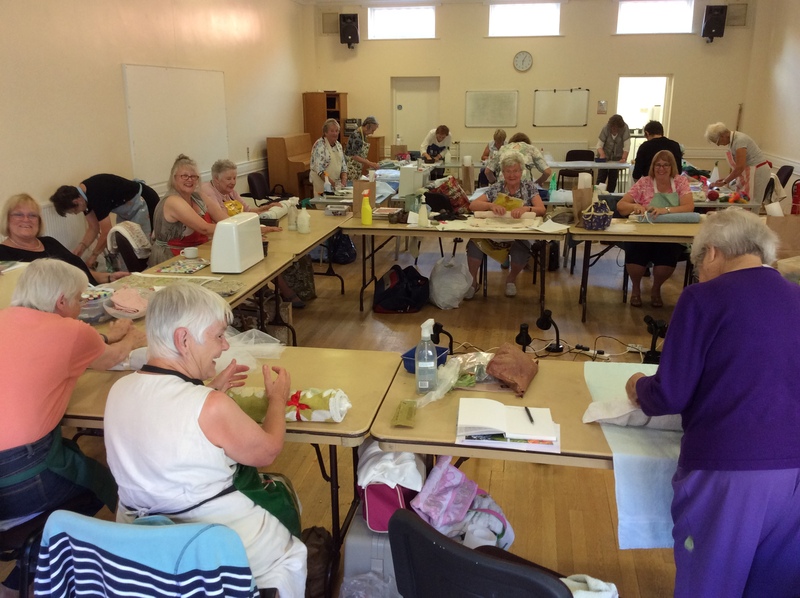 This morning I heard one lady was in the room and working at 6am……I certainly wasn’t!!! 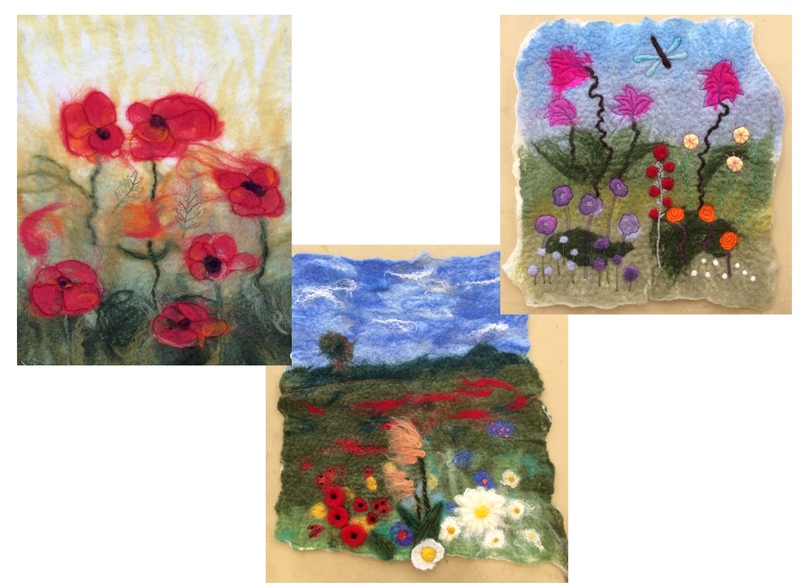 Most of us resumed work straight after breakfast adding needle felted elements and beginning to free motion or hand stitch into the felt. 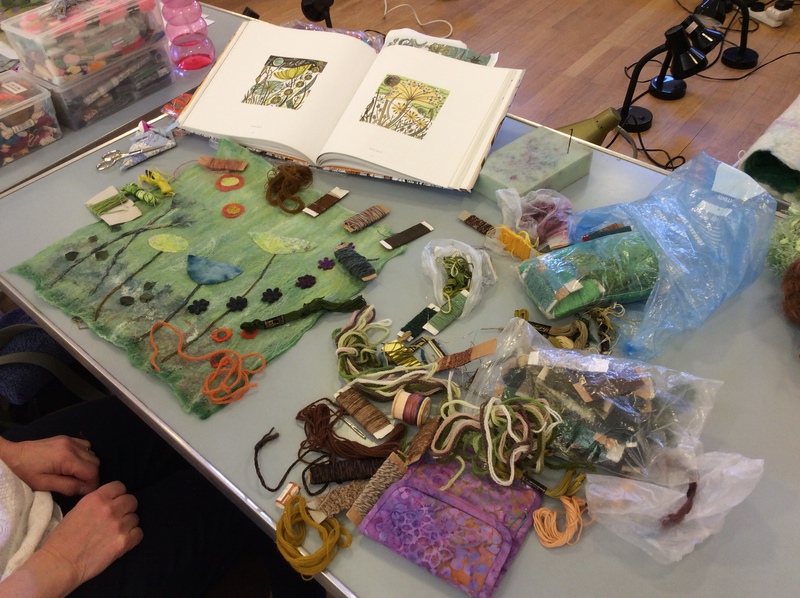 There is some fabulous work being created and I reckon we are going to have a really impressive “show and tell” tomorrow lunch time! 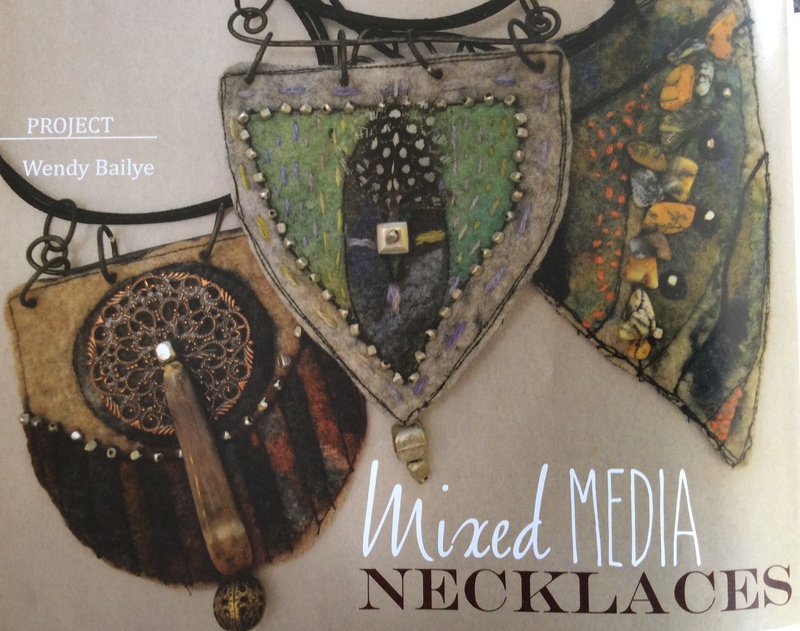 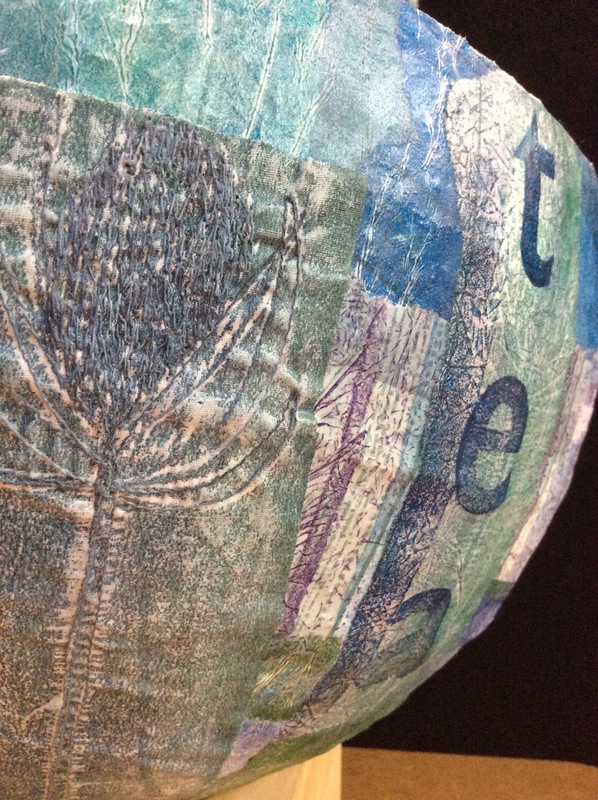 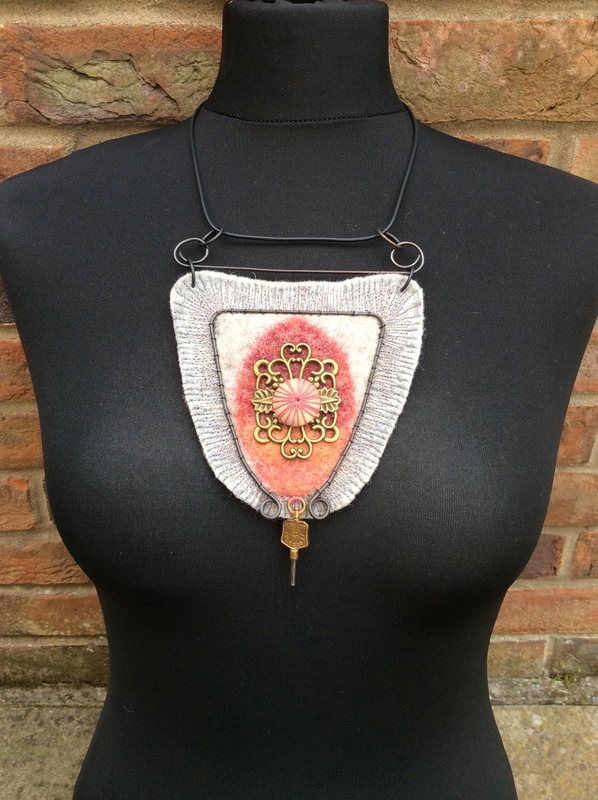 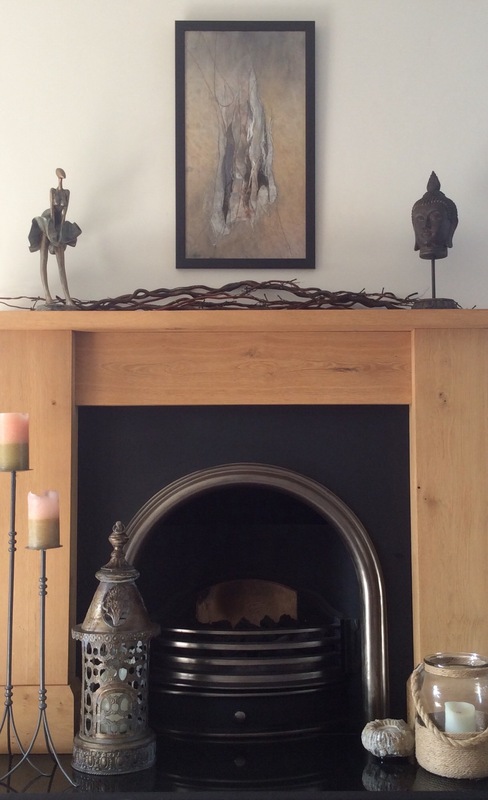 Watch this space…….